Nothing as fresh as from the Farmers' Markets. Visiting the local farmers’ market has become the cornerstone of a foodie’s weekend (and a nicer way to get your groceries than the supermarket). Stock up your pantry at these top 10 outings. A glimpse into Adelaide Farmer’s Markets. Held outdoors at Adelaide Showground every Sunday from 9am – 1pm. Each week cooking demonstrations are held inside the Market Kitchen at Adelaide Farmer’s Markets, using local produce to create mouth-watering dishes. You may recognise some of the faces from MKR and MasterChef. Ice-cream in flavours such as lemon myrtle, native mint, lilly pilly and wild ginger from Bushtucker Ice-cream. Delicious raclette cheese available at Melbourne Farmer’s Market at Collingwood Children’s Farm. 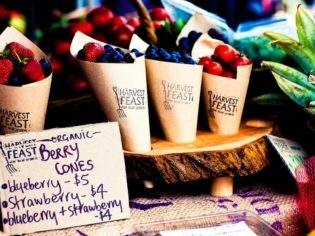 Melbourne Farmers’ Markets is held outdoors at Collingwood Children’s Farm on the second Saturday of each month, 8am – 1pm. There’s a $2 entry fee per adult (children are free), which supports projects at the farm. The kids will love getting to know the farm animals. It’s completely plastic bag-free here, so don’t forget your canvas shopping totes. The pancake stall is run by volunteers and all funds raised support the Young Farmers program. Tuck in for a feel-good breakfast. Mushroom out from beneath the shade: Eveleigh Markets, Sydney. Marketplace details: Undercover at Carriageworks, every Saturday (rain, hail or shine), 8am – 1pm. Market fact: Eveleigh Market features well-known Sydney eateries Bourke Street Bakery, Sonomo and Billy Kwong have stands here – you may even see Miss Kylie Kwong herself serving up steamed pork buns! Market special: Honey pollinated around the city from The Rocks to Marrickville at The Urban Beehive. Marketplace details: Outdoors at Bathurst Street every Sunday (rain, hail or shine) from 8:30am – 1pm. People perusing Farmgate Market in Hobart, Tasmania. Market fact: At Farmgate Market, everything sold must be grown or produced in Tasmania and only the people who grow, raise, produce, extract or pluck the goods can trade. Market special: Sourdough donuts filled with apple and cardamom jam or dark choc and salty pistachio. Marketplace details: Outdoors at Noosa Australian Football Club every Sunday (rain, hail or shine), 7am – 12pm. Fresh produce from Noosa Farmer’s Markets. Market fact: Noosa Farmers’ Market organisers are also behind the Noosa Food ETrail – a website showcasing a behind-the-scenes-style exploration of the local food region through fruit picking, farm tours, cooking schools. Plus markets and farm gates. Market special: Handmade quality olive oils, olive tapenade and fresh olives from Fat Hen Farm. Marketplace details: Undercover at Exhibition Park, most Saturdays from 7:30–11:30am. Why not pick up a gooey brownie from stallholder, The Hungry Brown Cow at Capital Region Farmers’ Market Canberra? Market fact: At Capital Region Farmers Market, the majority of produce at the market (excluding some specialty products) comes from less than 300 kilometres away. The distance travelled by each stallholder is listed on the market website. Market special: The pâtés of Fine Terrines & Pâtés come in all sorts of flavours from free-range chicken to Porcini and port – but if those don’t tickle your fancy, they’ll try to make one especially for you. Marketplace details: Talbot Farmers’ Market is held outdoors at Scandinavian Crescent on the third Sunday of each month, from 9am – 1pm. Browse vintage finds at Talbot Markets in Victoria. Market fact: The Town Hall Market is held on the same day just adjacent to the farmers’ market – it sells books, toys, crafts, clothing and more. Market special: The award-winning Cooks Treat Ripper Relish and BBQue Brew (both gluten free, too!). Marketplace details: This market is held at the Margaret River Education Campus on the third Sunday of every month, from 9am – 1pm. Pick up a treat at Margaret River Farmer’s Market. Market fact: Stalls at Margaret River Farmers’ Market are given priority based on how ‘local’ the produce is: if it’s made by farmers within the Margaret River Region with their own produce, it takes priority over residents of the Margaret River Region using local produce and those who use products from outside of the area and so on. Market special: Bahen & Co’s factory is not open to the public, so get your hands on the artisan chocolate handmade using cacao beans and raw sugar. Marketplace details: Barossa Farmers’ Markets is held undercover in the Vinters Sheds, Angaston, every Saturday from 7:30–11:30am. Barossa Distilling Company flavouring the farmer’s markets. Market fact: The farmers travel an average of just 15 kilometres to get here, so you know all the produce is local and super fresh. Market special: Fill up for breakfast on the delicious egg and bacon Market Burger. Marketplace details: Outdoors at Miami High State School every Sunday, 6–11:30am. Delicious freshly made Organic Vegan Museli, Bowls from Gold Coast Organic Market. Market fact: All produce at Gold Coast Organic Market must be straight from the farm and Certified Organically grown. But it’s not just the food that’s organic, there are also cleaning products, cosmetics, clothing and bedding. Market special: The fermented beverages from Buchi Kombucha, made from organic white, black or green teas (or a blend), organic raw sugar, and a symbiotic colony of bacteria and yeast, are meant to be ‘ridiculously good for you’. To sweeten the deal, they come in a variety of flavours including Ginger and Tumeric, Coffee, and Hibiscus Galangal Lime. Lovely pic of our Harvest Feast cherry cones! We’re at Salamanca Market, Hobart Tasmania 8am to 3pm every Saturday. THANK YOU for listing our farmers’ market in Australia’s 10 Best! For a tiny village of 300 residents it is a great achievement to be placed alongside the likes of Adelaide Farmers’ Market, Farmgate Market Hobart and the Barossa Farmers’ Market! What our tiny town lacks in population we more than make up for in a love of local food, passionate producers, supportive customers, dedicated volunteers (both past and present) and community spirit! A big THANK YOU to our stall holders, volunteers, customers and community that come together to make our market one of the BEST and thank you to Australian Traveller for the recognition! Great list! We’ll be adding these to our directory right away! So many great markets and wonderful food producers in this country and write-ups like this give them the recognition they deserve! And there are plenty more fighting to make the list too! Surely the original Farmers Market at Willunga gets a mention??? what about the ICONIC Jan Powers Farmers Markets in Brisbane??????? Tucked away in the Western Suburbs of Brisbane in Brookfield this genuine Farmers Market run by volunteers, uses its profits to feed the homeless and support Agricultural Science students in their honors year at the University of Queensland. Research into farming practices are essential, and this year prize money went to research into building stress tolerant soybeans in a climatically changing world; sustainable animal food identifying an effective strain of micro – algae to grow as stock feed, and learning to present research results to bio-science experts. Sounds like a great place with a great ethos. Loving all the farmers’ markets! Margaret River Farmers Market is held every Saturday 8-12 (between Dec-March 7.30 – 11.30am) all year round. I love the Northey St Organic Markets in Brisbane- bigger, fresher and in a much more beautiful setting than any other organic market. Delicious food and not much more expensive than conventional.